there's something to be said for waiting. "all good things take time." "everything's eventual." there's the an-tici-...pation. a delicious, squirrelly itch, which you're sure will never end. sort of like love. i suppose that there are a lot of pictures i take, that will never get posted here, mostly due to a lack of time and attention. and i apologize to any of the guys who have waited endlessly to see their car here. really, if you've been waiting that long, i wonder why you've never bothered to send me an email to ask about it. otherwise, i'm left to my own devices and whims as to what i post. and i hear that a woman's heart is a mysterious thing, at least my better half has me thinking so. let me know when you have me figured out, d.
some days, i have no idea which car i want to post, i love them all. other days, i just want to delete them all, and go in search of new cars and new shows. and then i have days, sitting here, worrying how many more can i play with before i run out of space. come on after xmas sales! i need new hard drives. anyway. taking a break from the legends of san pedro, to post one from the other show i went to that day. i found the token lifestyles car, of which there seems to always be one or two, at some of the better advertised shows. 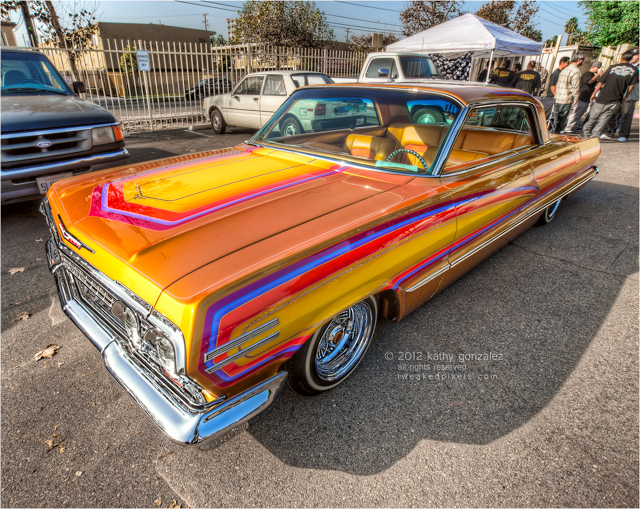 always immaculately painted, pinstriped and/or airbrushed. this one just seems so bright and cheerful in the craptastic background of santa ana. not one of my favorite chevys, but i liked it nonetheless. why ask why?